What is affordable carpet cleaning in Tampa FL? There is a big difference between affordable carpet cleaning and cheap carpet cleaning. The sign in the image above is for cheap carpet cleaning. Cheap carpet cleaning is right up there with pressure washing your carpet. 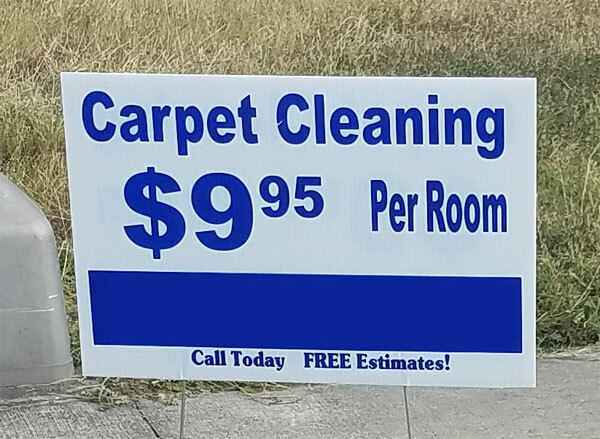 Cheap carpet cleaning is about the numbers. They try to get in and out of a house as quick as possible and move onto the next home. The cleaning is not about quality, its about how many homes they can get into in one day. Affordable carpet cleaning is about doing a quality carpet cleaning at a fair price. At Chem-Dry of Tampa we offer an affordable carpet cleaning service that includes all the major components needed for a quality carpet cleaning. We only service 3 homes a day to make sure each job is given all the attention necessary to make sure the job is done right. What is the cost of an affordable carpet cleaning? It should run about $40.00 to $50.00 a room or $0.35 to $0.39 a square foot. These prices are within the average range for an affordable carpet cleaning in Tampa FL. Don't settle for a cheap carpet cleaning that is going to be lacking in some of the basics needed for a good cleaning. For affordable carpet cleaning in Tampa FL call Chem-Dry of Tampa.